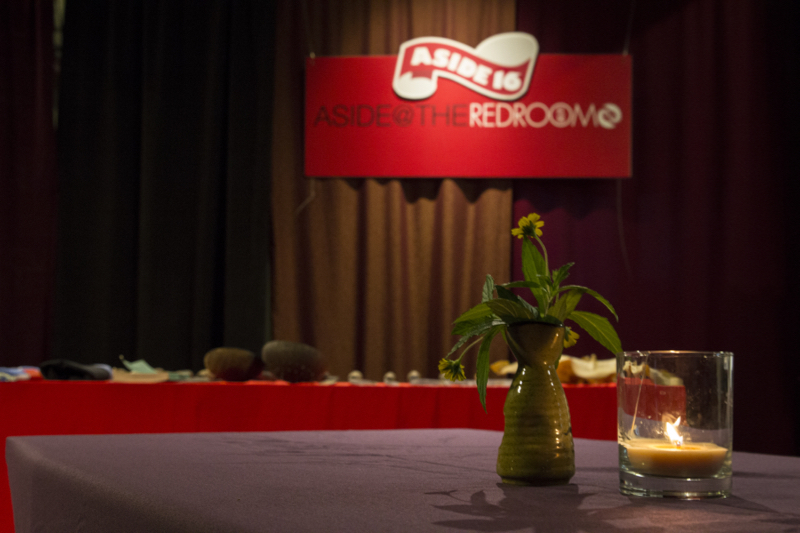 The June Aside at the Red Room was a feast for the senses in more ways than one. The evening was an educational journey through the many tastes and flavors of this island. 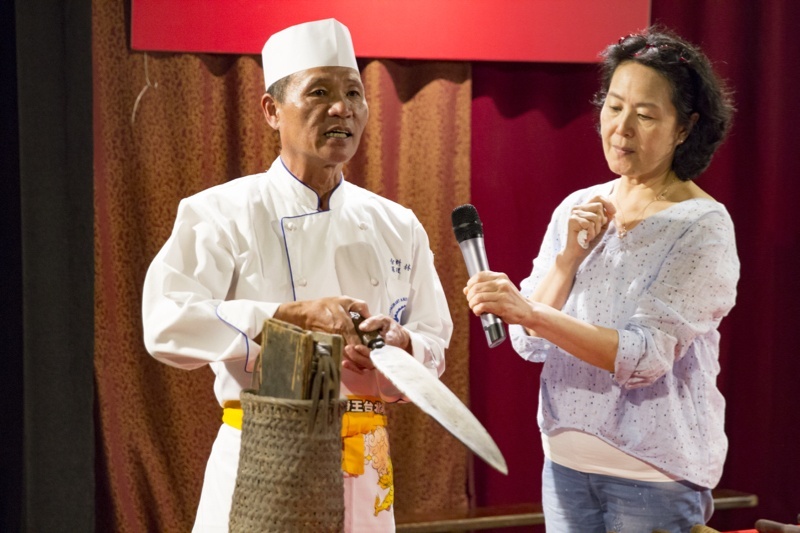 From Hakka Chinese to indigenous cuisine and traditional bandoh style banquets, our knowledge of Taiwan’s rich and diverse food culture was enriched and enjoyed by all who attended. 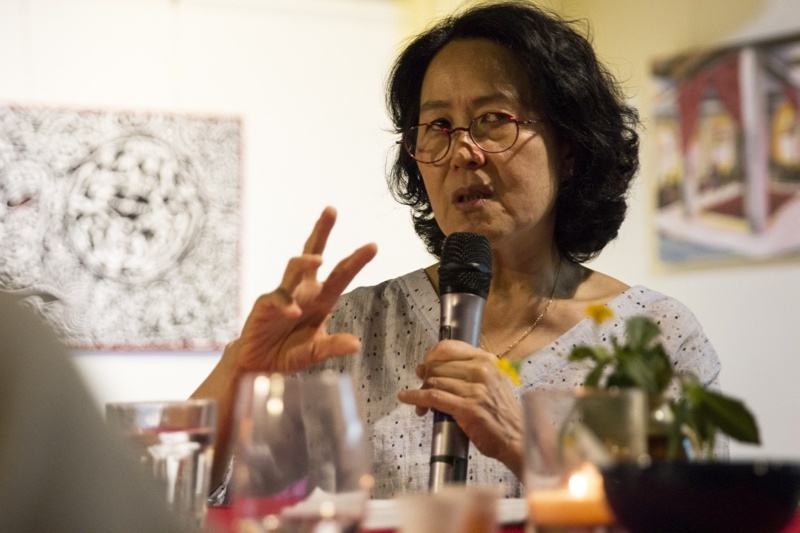 Katy Hui-Wen Hung 洪惠文 is an avid collector of recipes and culinary stories as well as a passionate advocate of Taiwanese cuisine. Her frequent travels have become a journey through Taipei’s food culture, past and present. 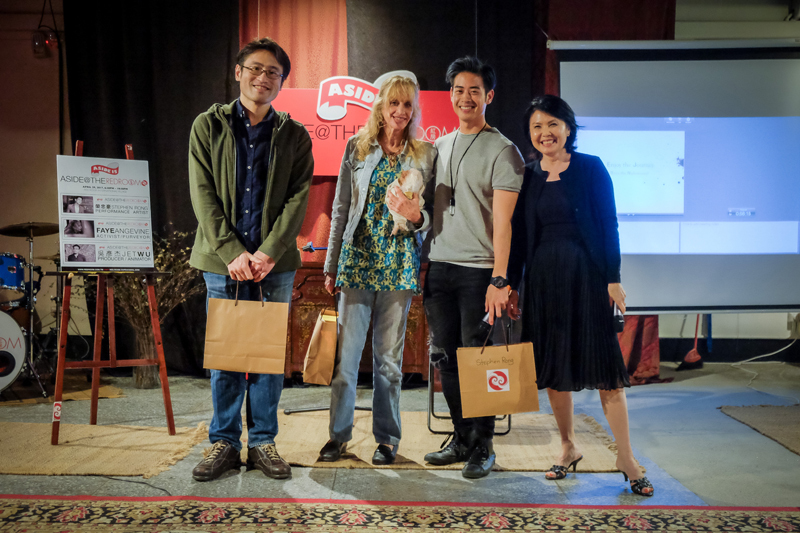 She spoke about her discoveries while writing her soon to be released book on A Culinary History of Taipei: Beyond Pork and Ponlai, co-authored by Steven Crook. Chuan Chun-Yi 全俊逸 is from the mountain Bunun tribes of Xinyi in Nantou County. 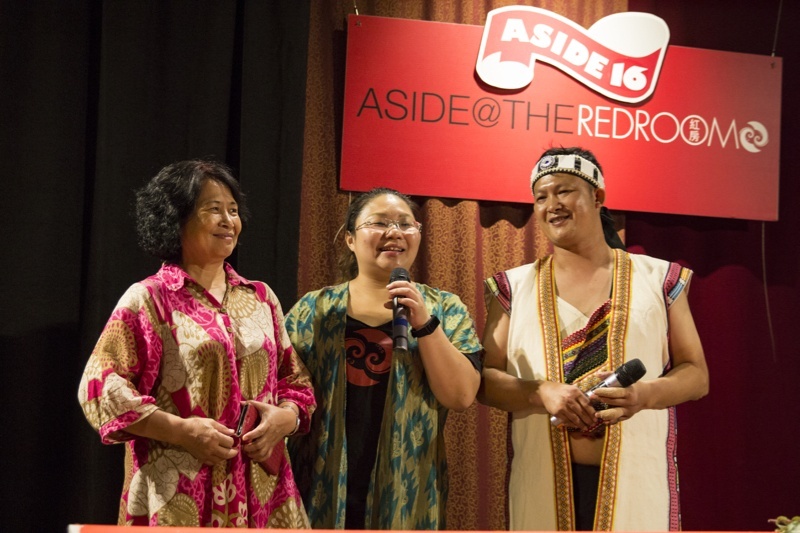 A shepherd by trade, he spoke about the abundant life force brought out by the earth and the sustainable management of land, life, and food by the Bunun tribe. Chuan also prepared a feast for all to share with his classic mutton tomato stew and fresh wild vegetables. Accompanied by Mochi and rice wine freshly prepared by his mother. Special thanks to each of the presenters for their time and sharing. Thank you to Chun-Yi for the delicious feast and to our generous partners Canmeng Aveda and Granola House for sponsoring the gifts. Thanks to Romona Guan for on the spot translations. Photos of the evening can be viewed here. 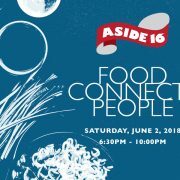 We hope to see you at the next Aside. Stay tuned for updates. 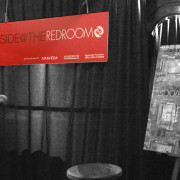 Sign up for our monthly e-news so you never miss out on a great opportunity to visit the Red Room! Challenges, Failures, Success… Is it possible to ever have one without the other? What do these words mean to different people? There are thousands of quotes on the internet from Sages, Scholars and other well-known people about this very thing. When we see famous or successful people, we may think, “They’re so smart” or “They’re so lucky” or “Their life is so easy”. We don’t spend much time thinking about embarrassing flops, setbacks or changes of direction they might have experienced getting to where they are. 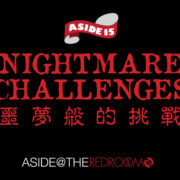 The theme of our last Aside 15 was Nightmare Challenges. 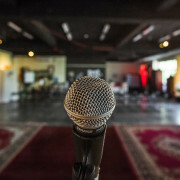 Each of our 3 speakers had different areas of expertise, interests and life experiences. They shared with us their vulnerabilities, challenges and how they moved forward despite of them. Starting the night off was Jet Wu 吳彥杰. 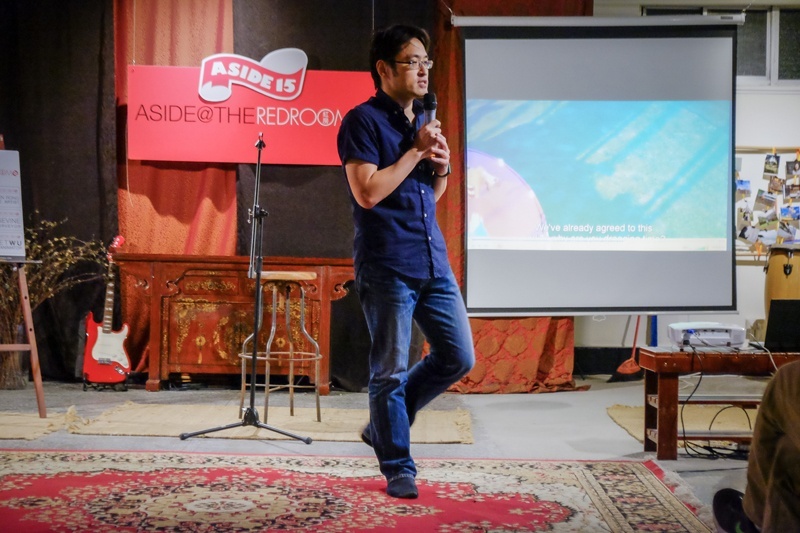 In 2012, he started WeTogetherStudio 共玩創作, the first Stop-Motion Animation Company in Taiwan for TV and Advertisement. His team’s soon work won recognition and awards in many domestic and international film festivals. But life isn’t always so smooth. Jet talked about how changes in the economy/industry forced him to make difficult business decisions that did not align with ideals of his team. He shared the pain of how they left one by one and also how he got so badly conned by a businessman in Hong Kong. It was at one of his lowest points when he realized letting go of his ego was crucial to moving forward in providing for his family. His idea to incorporate education into his work is now finally reaping rewards. His company provides workshops for amateurs, children and retirees. He also distributes animation production software & curriculum to Taiwan’s educational institutions. Faye Angevine, successful businesswoman and purveyor of fine antiques, was our next speaker. In fact, the lovely antiques that grace Red Room space are from her Bai Wen Collections. Having lived in Taiwan for more than 40 years, she’s had more than her share of ups and downs especially while doing business in China. Faye spoke about challenges related to 2 of her passions – antiques and animals. She shared a light hearted version of the nightmarish tour she had during an antique sourcing trip with the “Housewife Sallys”. Taking a group of western women into less civilized areas of China was wrought with incidents – which prompted a promise to herself never to do it again. 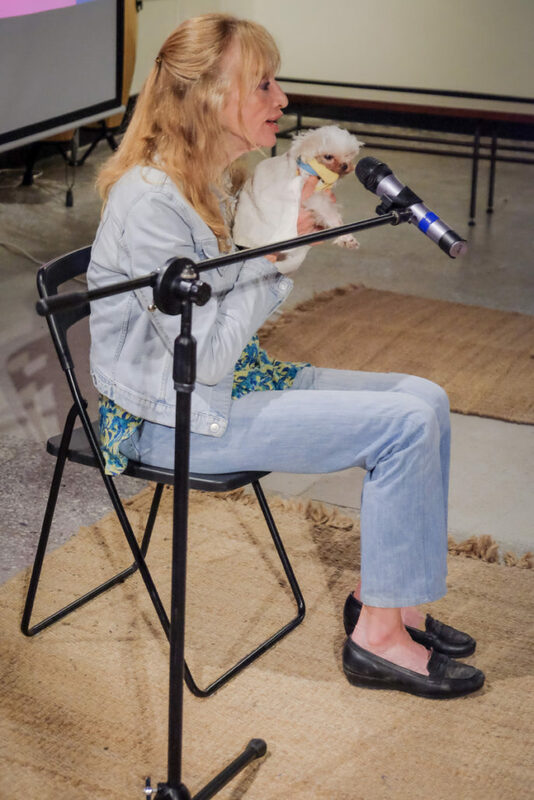 Due to her love of animals, Faye has generously adopted and rescued many, many dogs over the years. Trying to create more awareness and compassion toward animals, getting Government regulations changed and raising funds to support animal welfare continues to be an uphill battle. 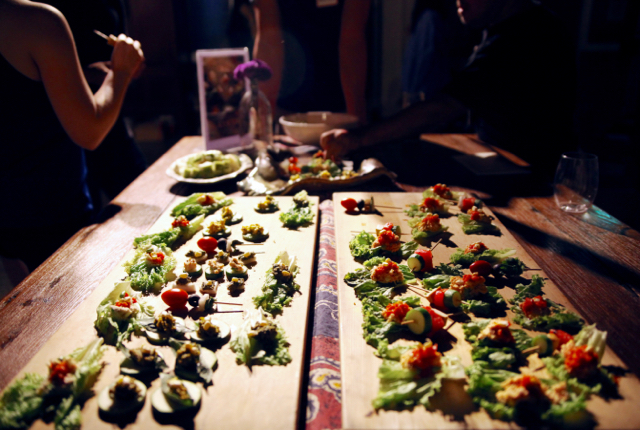 Everyone took a short break and got to sample Chef Zoe’s amazing offerings of fresh vegetarian bites. Citrus Herbs & Greens, Pumpkin Kaddo Bourani and Roasted Sweet Chili with Chocolate were both artistic and delicious. 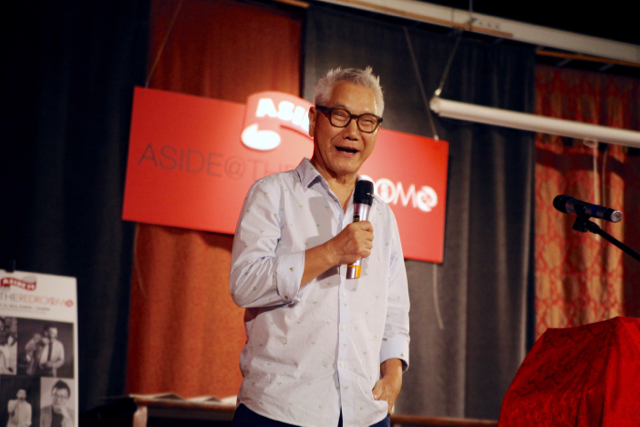 Stephen Rong 榮忠豪 was the last speaker and rounded out our night. Starting with a serious health challenge during his teens to overcoming his mom’s objections about his decision to move to Taiwan and pursue a singing career in 2009, Stephen really impressed on me his motto of “Never give up”. Even when he was told he couldn’t sing, he wasn’t good looking enough and he’d never make it, Stephen continued to pursue his dream. At one point, he had only NT$500 left in his pocket after some he trusted stole all his money. 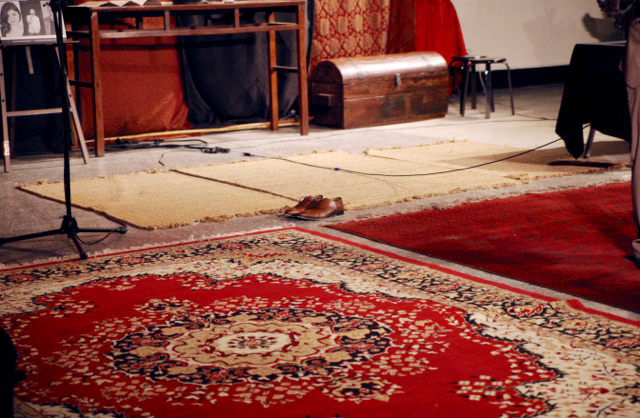 He failed in winning singing competitions in Taiwan and Hong Kong; as a travel host, he was once abandoned in Malaysia with only $10 for food and there were many other nightmare examples in his life. After all these pitfalls, he picked himself back up, learned from his experiences and worked hard at improving himself in every way that he could. Stephen is finally living his dream. He has been in several commercials, film and stage productions; hosted TV shows and recently held his own concert. As was shared during the evening, life is not always easy, it comes with twists and turns and bumps on the road. It’s wise to remember is that each challenge is a learning experience. Life can be quite amazing if you believe in yourself and persevere. It has certainly made me think about my life! 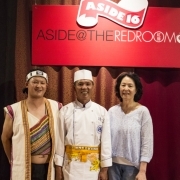 This Halloween, get your “trick or treat” fix at Red Room’s Aside 15. The theme for this upcoming Aside….Nightmare failures. Have you ever noticed that the best success stories often begin with failure? Why are those embarrassing flops, setbacks or radical changes of direction seem like the “required” first steps on the road to fame and fortune? Stephen King‘s first horror novel Carrie was rejected 30 times and thrown in the trash before becoming the prelude to hundreds of successful published books. Ang Lee failed Taiwan’s college entrance exams – twice. He tried to go to acting school, but they said his English wasn’t good enough. Unemployed for 6 years living off of his wife’s salary, he had a bank balance of US $26 at the birth of their second child. Thomas Edison was told he was “too stupid to learn anything” and it was only after 1,000 unsuccessful attempts at inventing a light bulb that he finally succeeded. Jack Ma failed his exit exams several times in elementary & middle school; failed college entrance exams 3 times; applied to Harvard 10 times and was rejected every time. Out of 24 people who applied for KFC when they entered China, he was the only one rejected. Out of 5 people who applied for a job on the police force, he was the only one rejected. His first 2 business ventures failed and then came Alibaba …zero revenue for the first 3 years. 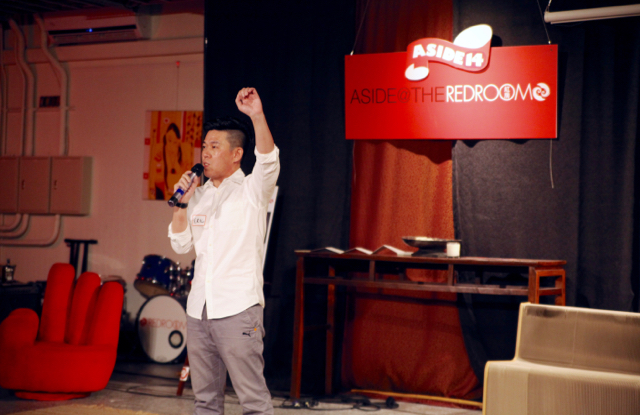 Come join Red Room on Saturday, October 29, 2016 as three of Taiwan’s own share their horror stories of personal and/or business failures. 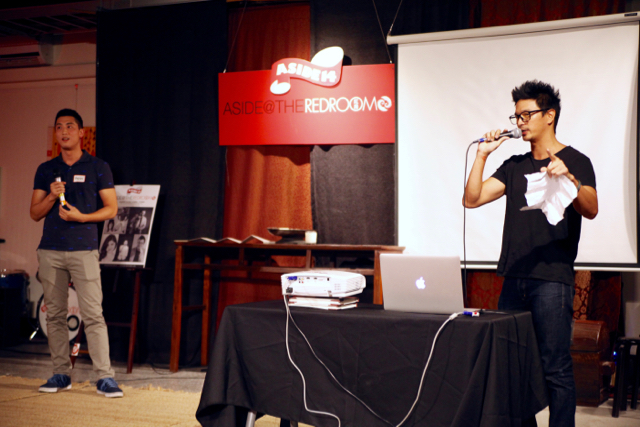 Listen to how they handled and overcame multiple obstacles to be where they are today. Be inspired if you happen to be facing insurmountable challenges in your life. RSVP here. “I’ve had dreams and I’ve had nightmares. I conquered the nightmares because of my dreams”. The Summer of 2016 ended with Aside 14 beating the heat with a cool night of fun & laughter. Whether it was a slight giggle, a huge belly laugh or anything in between, laughter can bring people together and establish amazing connections. In an instant, laughter can change the atmosphere of a room from chilly to one of warmth. 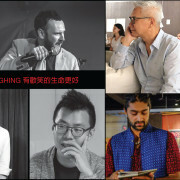 That was what several of Taipei’s talented performers did while rocking the Red Room with their banter and wit. 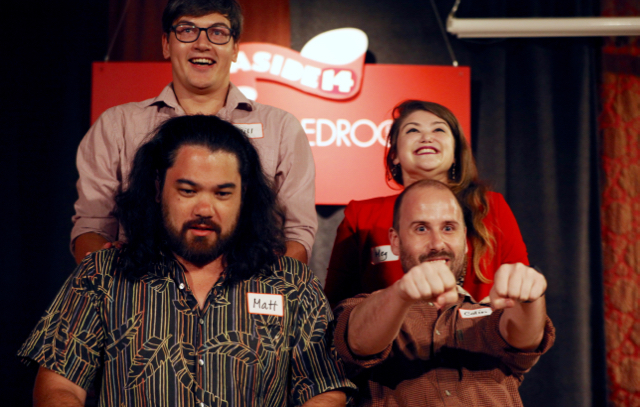 From Comedy to Improv to Insults and Toasts, laughs were definitely contagious this evening. Starting the evening off, stand-up comedian Charlie Storrar shared his passion for the craft with famed British sense of humor and well-timed quips. Next came the hilarious videos of the dynamic duo, Kevin Lee & Michael Wong from the 什麼東西 LK Show. Their original comedy web series poking fun at daily life situations has accumulated millions of views. 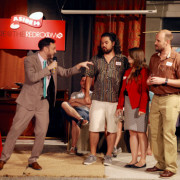 To round out the first half of the show, Meg Anderson and her Sweet Danger Improv troupe (Matthew Long, Colin Norman, and William Openshaw) created on-the-spot comedic vignettes using input from their captive audience. 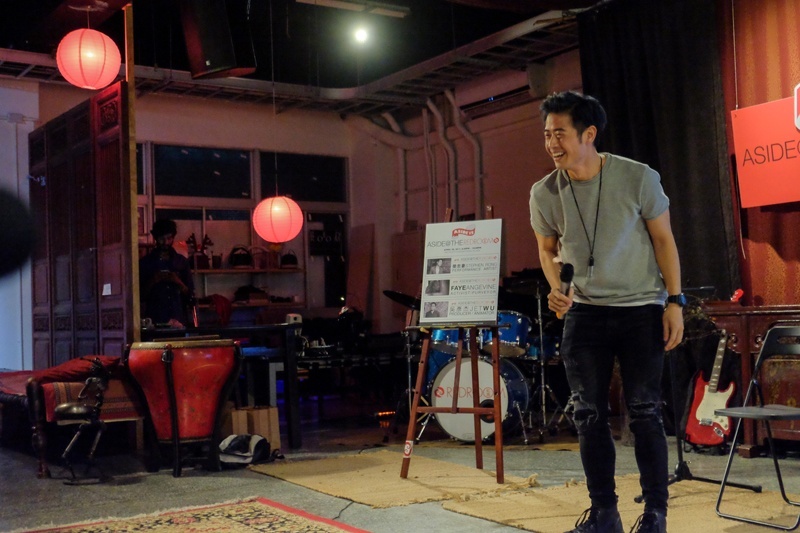 After a short break of feasting on delicious raw vegan treats by CoCo, stand-up comedian Eric Chang started off the second half with a bang. His routine focused on hysterical cross-cultural behaviors and situations, which we can all identify with in our own lives. Then came the very first and much anticipated Roasts of Red Room! 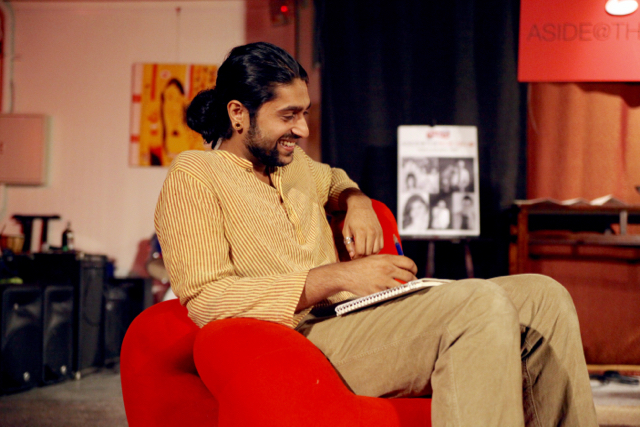 Co-founder Ping Chu and our own RR curator Manav Mehta were the first to feel the heat. Friends and foes alike gathered for battle under the capable direction Roastmasters A-Fong and the now infamous Charlie Storrar. First up in the hot seat – Ping Chu. 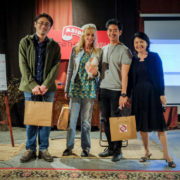 For many of us who have not known Ping for long, it was enlightening and amusing to hear roasters, Tina Ma, Brendon Chen and Brook Hall share stories about his past, quirks and foibles. Last but not least, Manav Mehta stepped up to take his due. Long-time friends, David Gentile, Sam Dulaney, Addison Eng and surprise roaster Goober all took turns spilling some of Manav’s secrets. Most likely Roma learned one or two new things about her son during this process. As the saying goes, “with friends like that, who needs enemies?” Of course, Manav did not take things lying down. He came back with a few pokes and jabs of his own. But as all of us present were aware, everything said that evening was in the spirit of fun and camaraderie. As E E Cummings said, “The most wasted of all days is one without laughter”. Well, it was great knowing that none of us present wasted our day.